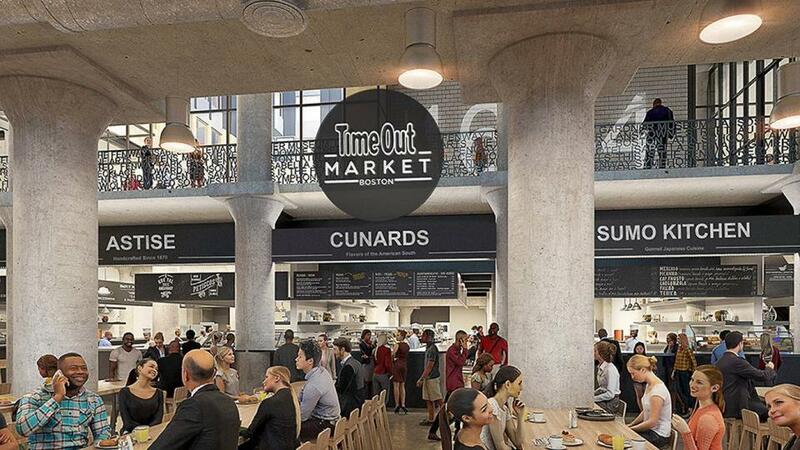 A rendering of Time Out Market Boston. A new foodie hotspot is moving into the city. The global media business Time Out Group says it will launch Time Out Market Boston, a food hall-style emporium, in 2019. In a statement, the company said the market will have 16 food outlets, two bars, and a cooking academy, along with shopping and outdoor patios. The food hall will occupy a portion of the ground floor at 401 Park Drive in the Fenway, formerly the Landmark Center. To supplement the food hall, Time Out will also build a one-acre park in front of the building with outdoor seating. And to allow people to take advantage of the space year-round, it hopes to install a skating rink during the winter. Boston’s Elkus Manfredi Architects has redesigned the combined 25,000-square-foot space, which most recently a Best Buy. “It was important for us to find a space where people work, where people live, and where tourists would go,” said Didier Soillat, Time Out Market’s chief executive. Boston will be Time Out’s third market project. Time Out Market Lisbon opened in 2014, and Time Out Market Miami is scheduled to open in South Beach in 2018. Time Out recommended looking to the Lisbon location for a preview of what Time Out Market Boston might look like. In three years, the Lisbon market became the Portuguese capital’s number one tourist attraction. The food hall welcomed 3.1 million people in 2016. Soillat said Time Out is tapping local talent for all aspects of the project, from planning to the products that will be sold. Time Out is primarily known as a media company, with digital city guides covering 108 locations in 39 countries around the world, from Europe and Asia to the Middle East and North and South America. The food-hall model has been growing in popularity, with patrons interested in having various restaurant options under one roof, as well as prepared dishes and an array of shopping options. Chef Mario Batali expanded his Eataly brand into Boston in November 2016 with a 45,000-square-foot food hall in the Prudential Center.